How to use: Use these very high quality clay mask once or twice per week for amazing results. First cleanse your face and then using the applicator provided and apply a light covering of the mask to the complexion. Make sure the face (and neck if you wish) is completely covered, but avoid putting the mask on the lips and eyelids. Clay masks have the ability to pull impurities and toxins from the skin and also provide a mild exfoliating action. Your skin will feel softer and smoother and look brighter after use. Grab a drink, put on some music and sit back and relax while the mask does its work. Depending on how thickly you applied the mask it should be dry to the touch after about 15 minutes. Rinse the complexion with warm water until all traces of the mask are removed. Your skin will feel soft and smooth and look clean and refreshed. If your skin is a little dry then apply a light moisturiser. We strongly recommend that you use our “200ml Clay Mask” on an alternate day to a Salicylic acid peel if you have acne. That way you get the clear pores that your skin needs to be healthy and heal. More information is below. Congestion in the pores (strictly speaking the follicles) is the primary cause of acne outbreaks. The pores fill with a mixture of natural oil (sebum), dead skin cells, and dirt. If the follicle remains open the trapped gunk oxidises (turns black) and forms a blackhead. If the follicle closes over the gunk provides a resource for the multiplication of acne causing bacteria which invariably leads to an inflammatory response - an acne spot. 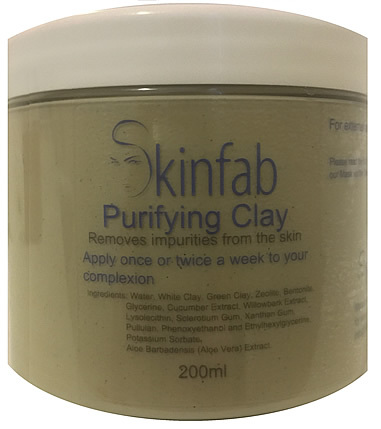 Purifying Clay Mask combines the most effective clays - french green clay and zeolite with willowbark extract and aloe vera to create a highly effective detoxifying and congestion busting remedy for oily and combination skins. The willowbark extract delivers natural saliylic acid which acts as a mild exfoliating agent to brighten a dull complexion and also boost the acne fighting properties of the clays. Aloe Vera helps soothe an often inflamed complexion. Ingredients: Water, White Clay, Green Clay, Zeolite, Bentonite, Glycerine, Cucumber Extract, Willowbark Extract, Lysolecithin, Sclerotium Gum, Xanthan Gum, Pullulan, Phenoxyethanol, Ethylhexylglycerine, Potassium Sorbate, Aloe Barbadensis (Aloe Vera) Extract.